Promoted by the Trustees of the Bute Estates who had acquired valuable mineral rights in the Rhymney Valley, the Rhymney Railway Company was incorporated by an Act of Parliament dated 14 July 1854 to construct a railway between Rhymney Iron Works and Hengoed where a junction was to be made with the Newport, Abergavenny and Hereford Railway. The early years were difficult; traffic was slow to develop and disputes arose with the Taff Vale Railway over transhipment costs at Cardiff East Dock, but by 1861 traffic was rising and agreement was reached with the Bute Estates to capitalise the arrears of rent and dock dues. For many years, the Rhymney Railway was dominated by its charismatic General Manager, Cornelius Lundie, who also had overall responsibility for all Departments on the railway. 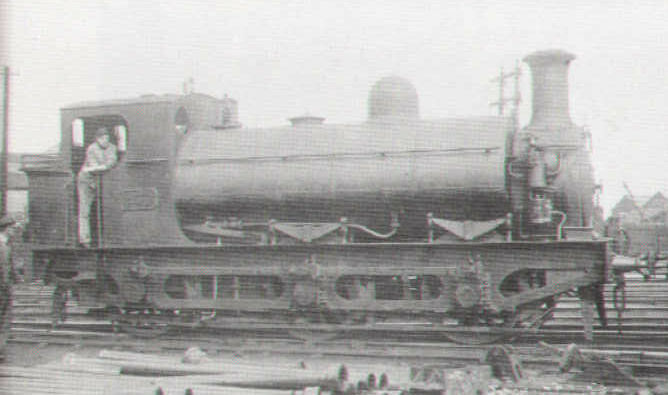 Lundie designed the outside-frames saddle tanks which became synonomous with the early railway, the first batch of which were supplied by Sharp Stewart in 1872. further batches followed, and these locomotives ably coped with the expanding heavy coal and mineral traffic until the First World War. C.T. Hurry Riches became Locomotive Superintendent in 1907 and there followed the rapid development of modern 0-6-2 side tank locomotives for both mineral and freight traffic; two railmotors built by Hudswell Clarke also entered traffic. The Rhymney Railway became a constituent company of the GWR group on 25 March 1922, having passed from a penniless concern to a prosperous railway and become one of the best investments of its day - its lucky shareholders regularly received dividends of 9% on its ordinary shares in its later years. Nor was the railway neglected by the Grouping, the wartime arrears of maintenance had been caught up with, the rolling stock was modern and in first class order, of sound design and built with a view to further expansion. The Rhymney Railway. Barrie, D. S. M. Oakwood Press, Lingfield, 1952. The Aber Branch – Caerphilly to Senghenydd. Chapman, Colin. Welsh Railways Research Circle, Newport, 2002; ISBN 0952726734. The Rhymney Railway Volume 1 The Main Line from Cardiff. Hutton, John. Silver Link Publishing Ltd, Kettering, 2004; ISBN 1857942272. 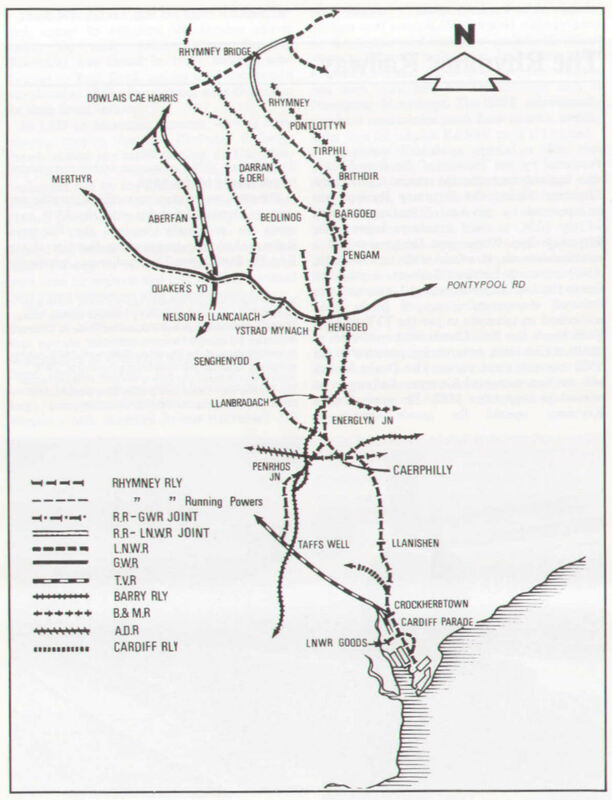 The Rhymney Railway Volume 2 Branch Lines in the Valleys. Hutton, John. Silver Link Publishing Ltd, Kettering, 2004; ISBN 1857942280. The Rhymney Railway. Kidner, R. W. Oakwood Press, Headington, 1995; ISBN 0853614636. South Wales Branch Lines. Morgan, H. Ian Allan Ltd, 1984. Caerphilly Works 1901-1964. Mountford, E. R. Roundhouse Books, 1965. Rhymney Railway Drawings: Welsh Railway Records Vol 1. Nicholson, N., Jones, T. and Lloyd, M. Welsh Railway Research Circle / Black Dwarf Lightmoor 2010. Six Railways to Merthyr. Hodge, John. Welsh Railways Research Circle, 2014. ISBN 978-09527267-7-7. WRRC Journal Volume 5 No.4. Three Rhymney Railway goods vehicles. WRRC Journal Volume 5 No.4. Rhymney Railway standard wagons.